Please contact owner Bruce Email: thekathers@outlook.com - Phone: 904-501-9928. 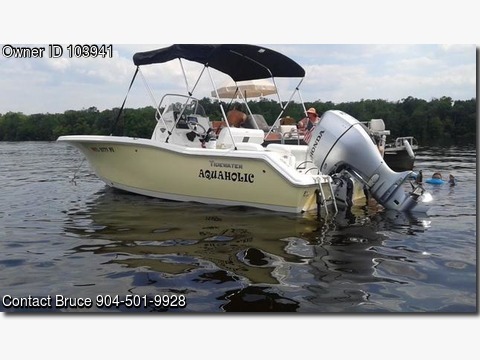 Yellow Hull with Black Bimini Top, Mooring Cover, 150 HP Honda engine w/100 hrs, Stainless Steel Prop, Hydraulic Steering, Power Tilt & Trim, Garmin GPS Map 741XS Interfaced with Fishfinder & Chart Plotter. Also an AM/FM w/Ipod Connection, Bluetooth, and 4 Speakers, Full Gauges, Compass, Tilt Steering Wheel, Swim Platform, Trim Tabs, Livewell, 70 Qt Cooler, Fresh Water System, & Lots Of Storage, Also includes Coast Guard Pack Life Jackets, Anchor, Bilge Pump Auto/Manual, Fenders, and Docking lines. Great boat for fun and fishing! Has always been Professionally Maintained Since New, Only Used in Fresh Water and Kept Under Cover. Original Owner, Like New Condition, Records Available, and One Year Left on Engine Warranty.